Typical deck installation carries a lot of costs including tools and labor. Who has time for that? Surely, you wish to spend more time enjoying your space rather than laboring over it? Now, thanks to our line of decking tiles, you get all the benefits of a true hardwood deck without spending much money or energy! 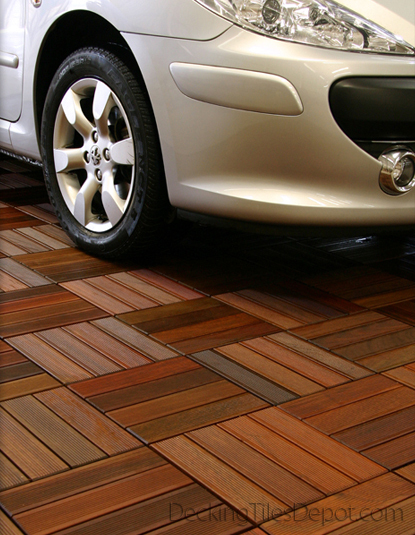 Learn more about our brand of decking tiles. Depending on the size and scope of your project, installing wooden deck tiles can take just a few hours. When you combine ease of installation with the world-renowned strength of hardwoods like Ipe, you end up with a high-performing, fashionable space. As you can see from the image to your left, the result can stand up to just about anything! See more examples of completed projects at our gallery of deck tiles pictures.